The Wesleyan Methodist Chapel was built in this location on Colborne (Lakeshore Road) in 1835. 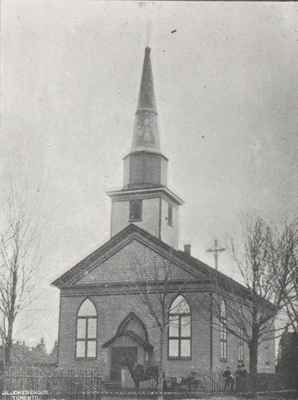 As the Methodists were unable to afford its upkeep, it was sold to the Anglican Church and named St. Jude's in 1840. On the left in this photo: W.H.Young "Cabinet Making and Undertaking." St. Jude's then built in its present location on Thomas Street 40 years later. In the new St. Jude's, citizens paid a nickel to go up in the tower as it was the tallest building in the Town. This Church was formerly Wesleyan from 1851-1878. It then became St. John's Methodist, and is the present day St. John's United. It is located on the South East corner of Dunn and Randall Streets at 262 Randall Street. 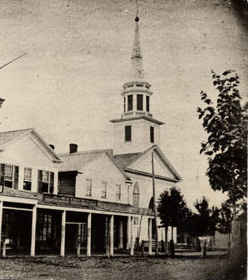 St. Andrew's Church was built in 1847, and is located at the corner of King and Reynold's Streets. It is interesting to note that in 1841, the total population of Trafalgar Township was 4,375, of whom 1,098 were Anglicans, 1,007 Wesleyans, 963 Presbyterians and only 281 Catholics, and yet still St. Andrew's was built. It is the oldest surviving Church in Oakville still in its original form. 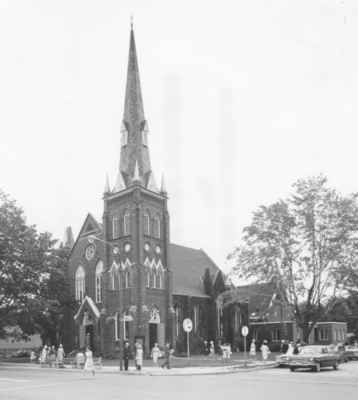 The cornerstone for Knox Presbyterian Church at Dunn Street and Lakeshore Road was laid in 1887. This photo was taken in 1962 and shows the Church as it exists today. 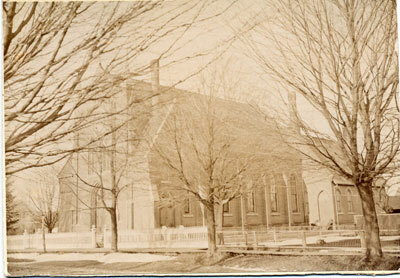 The African Methodist Episcopal Church at 37 Lakeshore Road West was founded in 1875 and became the Turner Chapel in 1892. African Americans had arrived in the Oakville/Bronte area as early at the 1830s. With the passing of the American Fugitive Slave Law of 1850, a significant increase was noted in the number of former slaves leaving the northern states and following the North Star into Canada West (Ontario). The cornerstone for the building was placed in 1891 and on January 1, 1892, the doors of Turner Chapel A.M.E. church were flung open for service under the leadership of Rev. William Roberts.